Get ready for a wild ride. Primer is probably the best movie you’ve never heard of. It was made for less than $10,000, and it was released with little fanfare in 2004. But despite its low-budget feel and lack of professional actors, Primer is one of the most riveting, thought-provoking films you will ever see. At first, I wanted to talk about Primer as a Forgotten Film Gem. But it never got any attention in the first place, so how could it be forgotten? It’s more like an Ignored Film Gem. So then I thought of doing a straight-up Movies That Improve on Multiple Viewings review of it. But as I started generating ideas for this review, I realized that it has a lot in common with Groundhog Day and several other movies. So I’m going to take a bit of a hybrid approach to this film, starting out with one type of review and ending with a Movie Matchup. I hope I can do this film justice. I’m not an engineer, nor do I have a firm grasp of quantum mechanics. All I know is I love this movie, and I think you will, too. So let’s jump inside the box and get ready for an experience we’ll never forget. Trying to describe the plot of Primer is like trying to untangle the plot of Memento (or pretty much any Christopher Nolan film, for that matter). But I’ll do my best to sum it all up. Two entrepreneurs, who are running a side business out of their garage, accidentally build a device that can transport objects through time. They soon build a larger version so they can both fit in it. At first they only go back a few hours to trade stocks and make money, but each character starts going back even further without the other’s knowledge, causing all sorts of paradoxes and problems for each other. Things eventually come to a point where there are now multiple copies of each main character, and the time-traveling doubles have to part ways so they don’t mess things up anymore. I know this doesn’t sound particularly like Groundhog Day, but trust me, you’ll see what I mean shortly. Primer is so ingenious, it already has me asking questions before the film even starts. On the outside packaging, it says it’s rated PG-13 for “Brief Language.” But right before the movie begins, it says the film is actually rated R. What? Suddenly I had no clue what I was in store for. I know the line between PG-13 and R has been blurred over the past four decades, but as I watched I didn’t know how this movie could possibly warrant such a harsh rating. Even PG-13 seems extreme. Back to the Future has way more swearing than this movie, and it’s just rated PG, for crying out loud. I think Primer earned its rating not because of swearing (which it barely has any of, by the way) but because the ideas that are coming from the characters’ mouths are so astonishingly complex that they would blow children’s minds. I looked it up on the MPAA website, and this movie is definitely rated PG-13. So why did they throw in an R rating at the start? Was it a mistake or did they purposefully try to throw off the audience? I don’t know, but it definitely adds to this movie’s mystique. The logic behind time travel in this film is that you can enter a field that is constantly moving between two points and exit that field at a point earlier than when you entered it. I couldn’t tell you if the theory behind this is based on real science or if it was made up by the writer, but either way it presents a big challenge for the film. Basically the movie has to present a linear plotline while interweaving all sorts of paradoxes and recurring scenes and themes without getting overly complicated or redundant. And it pulls it all off beautifully. In this way, Primer is similar to 1989’s Millennium. Except that Primer is good. I know I’m going off on a tangent, but I really wanted to like Millennium because I love the book. However, that film is a textbook example of how not to handle time travel. The film is so repetitious and boring that you lose interest in keeping up with what’s happening by the time they limp to the climax. Primer’s biggest strength is that it’s extremely selective about what it shows the audience. There are so many things that the film hints at, and it forces the audience to put the pieces together for ourselves. This saves it from repeating itself too often, and it also makes the experience much more satisfying after you watch it several times and you finally understand what’s really going on. Oddly enough, Primer sort of feels like The Godfather at times. Aaron and Abe are scheming and creating their incredible invention in their garage, but they can’t talk about it with Aaron’s wife. When she walks in the room, they often get quiet and secretive. They don’t want to involve her, maybe to protect her or maybe to protect themselves from anyone’s prying eyes. They’re not really doing anything illegal (unless assaulting a duplicate copy of yourself is a crime. I don’t think there’s a legal precedent for that, yet). But they try to keep what they’re doing extremely secret so no one else gets involved. When their secret starts to fall apart, they have to take extreme measures to set things straight. It’s kind of like how Michael Corleone has to lie, cheat and murder on numerous occasions in order to protect his family. All the while, he keeps his wife and children out of the loop, mainly to protect himself because of his increasing paranoia. Right after Aaron and Abe build the first iteration of the time machine and they start experimenting with it, the scene suddenly goes black and we shift to the most disorienting part of the movie (and that’s saying something). Abe wakes up one night in his apartment, and he talks to Aaron on the phone. The whole time this is happening, the editing keeps showing things out of order. Abe answers the phone and we suddenly cut to him getting up and then we cut to him back on the floor. It’s extremely jarring, but soon we get past the weird editing, and we just see the characters going in normal time. The point of this strange scene is to show us how the characters are about to start seeing the world. When they go back in time, they get to go through the same events and share the same conversations again and again. It probably feels odd at first, but after a while they get used to it, and they become experts at staying a step ahead of everyone around them. After a few days of time traveling, Aaron and Abe start talking in strange ways. The most surreal moment comes when Aaron asks Abe, “Are you hungry? I haven’t eaten since later this afternoon.” That’s the only line in the movie that made me laugh. It sums up both the absurdity and the beauty of the situation. Everything is so out of order and tangled that the movie can get away with a line like that without seeming completely absurd. I love it. Now let’s get into the Movie Matchup portion of this review. Primer is a high-tech version of Groundhog Day. There’s an interesting dichotomy to these films. Groundhog Day is so good because it doesn’t need a cause for its time travel. Primer is so good because it has such a believable cause for its time travel. I’m going to proceed with the assumption that you’re already familiar with the plot and characters of Groundhog Day. If you’re not, either watch it or read my Cars vs. Groundhog Day article first. The characters quickly discover that there are no consequences to their actions. Early on in his time-travel exploits, Aaron idly muses about what he would do if he won the lottery. He would walk up to his boss (who he doesn’t like at all) and he would punch him right in the face. This fantasy leads to the realization that he can have his cake and eat it, too, by enjoying that (admittedly cruel) experience and then going back in time and preventing himself from doing it in the first place. In Groundhog Day, Phil Connors does all sorts of things with no concern about the consequences because he knows that every morning he’ll just return to the previous day. The first day that he really grasps the significance of this situation he’s approached by his old “friend” Ned Ryerson. Rather than try to politely get away from him, Phil decks him and walks merrily away. It turns out time travel can be pretty boring because the characters spend a lot of their extra time playing pointless games. 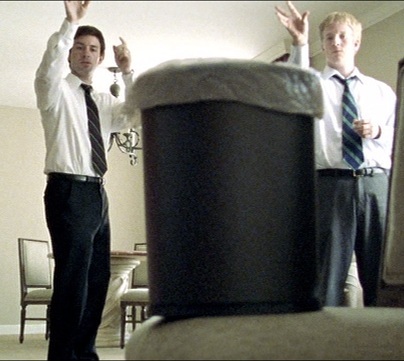 In Primer, the first day that Aaron spends traveling through time, we see Abe and him spend all day in a hotel room playing simple games like throwing things into a trash can. In Groundhog Day, the first time that Phil truly opens up to Rita about his time-warp problem, they spend most of their time in his hotel room throwing cards into a hat. Oh, the excitement. The characters come up with a skillful way to make a lot of money in no time. Aaron and Abe come up with a clever idea to game the stock market. They go through a whole day, see which stocks rise the most that day, and then go back in time to the start of the day and buy and sell as much of that stock as possible at the right moments. Phil takes a more direct approach: he steals a bag of money from an armored truck because he knows exactly when no one will be looking. This is just a little thing, but it’s interesting that the signal for the characters’ arrival back in time is a metallic sound. The box opens with a loud clang in Primer, and at one point in Groundhog Day we get an extreme close-up of Phil’s clock as it loudly turns 6:00 a.m.
Didn’t You Already Ask Me That? There’s a serious case of déjà vu in the way the characters talk. Aaron records all of the conversations he has with people over the course of several days. Then he goes back in time to before those conversations occurred, and he keeps a pair of headphones on most of the time so he can hear exactly what he should do and say to coerce people into taking certain actions. Phil can’t take a tape of his conversations with him from one day to the next, but he has a superb memory. He ingrains details about people and how to interact with them into his mind in order to manipulate them into doing what he wants them to do day after day. After a long period of trial and error, the main character manages to engineer a perfect day. Aaron keeps going back in time further and further until he is finally able to prevent a terrible tragedy when one of his friends is killed by a jealous former boyfriend. “Slowly and methodically, he reverse-engineered a perfect moment,” as one copy of himself puts it. How many times did it take Aaron going back in time to get everything to turn out exactly right? It’s difficult to tell, just like it’s hard to know how many decades Phil might have spent going through Groundhog Day. Despite these similarities, I don’t feel like these two films are close enough to do a full Movie Matchup of them. Their tone is just too different. Primer is strictly a mystery drama. There is almost no comedy or romance to be found in it. Groundhog Day is primarily a comedy and a romance. Sure, it has plenty of great drama and unique conflicts, but at its core, it’s a romantic comedy. 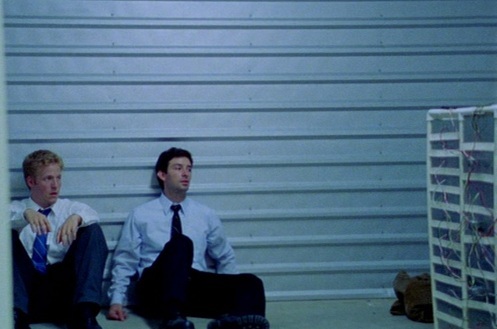 Primer shows that you don’t need many special effects or a whole bunch of money to tell a compelling story. You just need to have a really interesting idea. I love how this movie flaunts Hollywood conventions and proceeds to tell its story in its own way. There’s no love story, no fast-and-furious action sequences – they don’t even show us the big fight scene at the party. This is minimalist filmmaking at its finest. Now go out and watch it. And get ready to think outside the box. This entry was posted in Movies That Improve and tagged back to the future, bill murray, cars, christopher nolan, comedy, drama, films, groundhog day, independent film, low budget, memento, message movies, millennium, movie review, movies, mpaa, primer, romance, science, science fiction, the godfather, time travel. Bookmark the permalink.